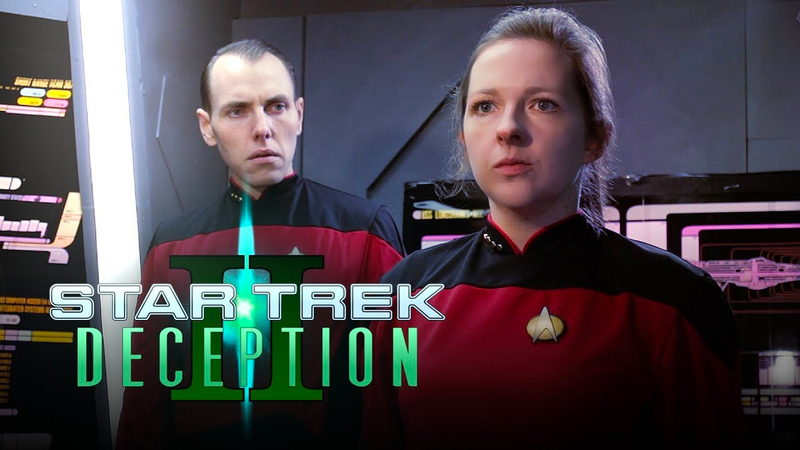 Last week , we started a look back at the history of Star Trek: Deception leading into the recent release of the amazing 15-minute sequel DECEPTION II, written and directed by British fan workaholic LEO TIERNEY. In part 1 of of interview, Leo and I briefly discussed his original 8-minute fan film, Deception, crowd-funded and produced back in 2013. The very positive reception to Deception led Leo to begin contemplating a sequel, although it would be three years before he would start building sets and going through other aspects of pre-production. Things ramped up big-time in 2017 as Leo shifted into full production mode, completing his sets, bringing on actors, and filming many of his scenes. Updates came quite frequently to Leo’s Facebook page for Deception, leading into my blog feature from February of this year. JONATHAN -When last I did an update on Deception II, it was this past February. You had filmed some scenes up through December and still had more to do. What’s happened between then and now? LEO – Post-production!!! But yeah, there were a lot of set extensions, green-screening, CG sequences, etc. to go through and polish up, which I was doing throughout all the filming. Pretty much every single shot in the film has had some sort of digital manipulation done to it, even if it’s just simple lighting poles needing hiding, or actors who weren’t available on the day that I needed to add into the shot. But hopefully nobody will notice. JONATHAN – I noticed a few, but they were composited together very nicely. 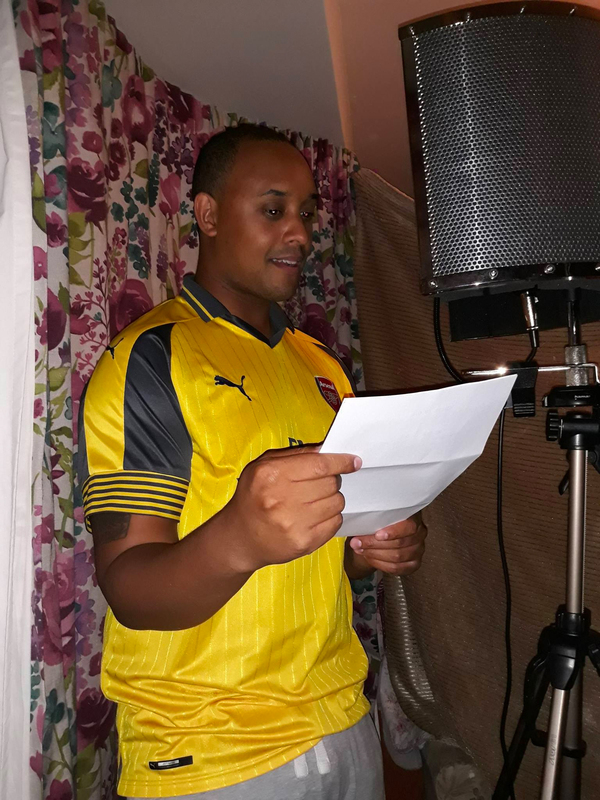 LEO – There was also the sound effects pass, music, and dialogue re-records, too, as I found out far too late in the production that the audio was way too echoey and needed a complete redo, something I’ll have to remember to improve upon next time! JONATHAN – So all of your dialog was ADR? You had to bring everyone back for pick-ups? What was that like trying to match the audio and the voices? Rick Huggins, as Lt. Miller, re-records his dialog after his scenes are shot. LEO – Most of it was ADR, there’s a couple of one-off lines that that didn’t really need rerecording, but yes I had to send out microphones to all the actors across the country so they could record themselves, and head down personally to record a few others. It was very difficult to match the onset delivery, and it took a while to get it perfect, but it’s better than having audio that’s painful to listen to. We had the same problem on Deception I where I never got round to re-recording the dialogue then, and if you listen carefully, you can hear cars driving past in the background, so it’s worth it. Hopefully, I’ve learned from my mistakes and the next project will sound better! JONATHAN – All told, how many hours do you estimate you yourself have put into this 15-minute fan film? LEO – It’s hard to guess the amount of hours. I mean, on a normal day I’d pretty much get back from work and then work on this Star Trek film in the evening. And on weekends, too, I’d spend working on scripts, the set, costumes, pre-viz, everything. So say, on average, 15 hours on weekends, I guess, another 3 hours every evening after work, so times that by 52 weeks in a year, times that by 5 years, and you’ve got, like, 7000 hours! Hah! Yeah, don’t think I worked quite that amount, as that’s insane, but suffice it to say, I’ve put quite a lot of love into this film! JONATHAN – Any amusing stories from either pre-production, production, or post-production? LEO – Most of the amusing stories almost always certainly come from the days when we were shooting and we’re all together in one room laughing and joking around—although we did have a fair share of postmen or delivery drivers turning up and wondering why there was a small army of Klingon warriors milling about the street! At some point soon, I’m planning on releasing an outtakes reel that should contain some of the silly shenanigans that went on while shooting. 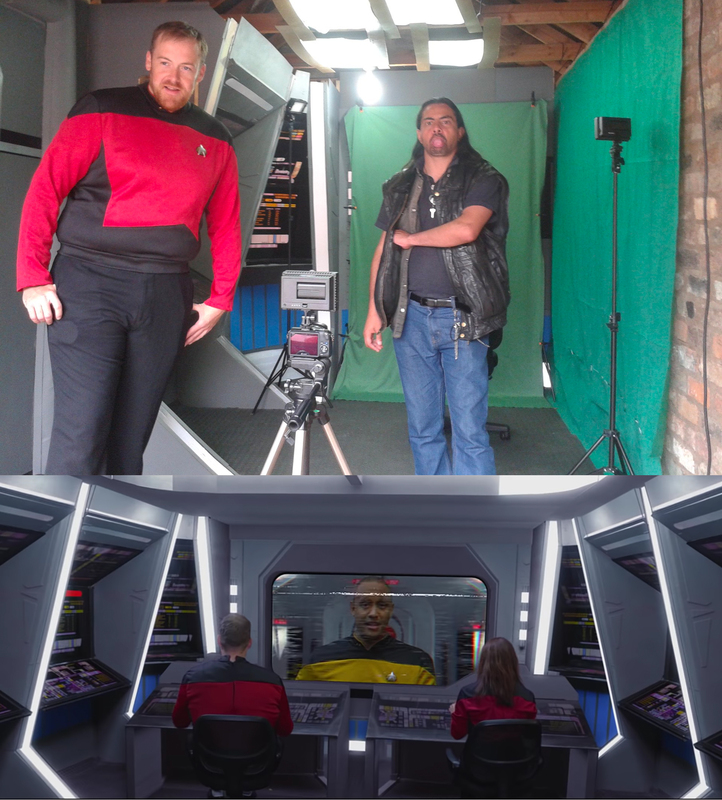 But I do remember filming the Captain and First Officer of the Federation ship and the temperature outside was FREEZING! I’ve got photos of both the actors squatting over radiators trying to keep themselves warm between takes. 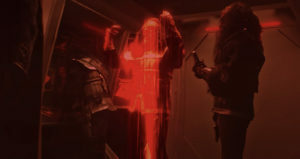 Oh, and there was the Klingon who would fart every time he got punched, stinking out the entire small garage. Good times! 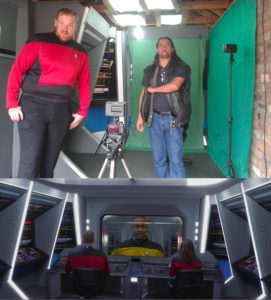 JONATHAN – Will you be keeping those set pieces you built to potentially offer to other fan filmmakers as resources to make their own TNG-era films in the future? LEO – I did offer a couple of fan film creators to use the set once it was complete, as I’m all for helping out fellow Star Trek creators. However, it seems like the interest has dwindled. The set is still up and running at the moment, and I’m hoping people will get excited about using it again after they see the set in action in Deception II. Otherwise, I’ll have to tear it down soon…as it would be nice to have my garage back after all these years! JONATHAN – So now that there’s a Deception II, will there be a Deception III? While I don’t want to spoil the ending for anyone who decided to read the interview before watching the film, you did leave us all with quite the cliff-hanger! LEO – Unfortunately, since this film has taken so much of my time to make, I don’t think I’m capable of surviving another sequel without being thrown in a loony bin afterwards! I wouldn’t mind if I was part of a team of creative minds that were all pushing forward together in creating a Star Trek film, but to be honest, it has just been me working away on this project alone for five years. Plus, with these new fan film guidelines constantly hovering above our heads, I would hate to get halfway through a project only to have all my hard work thrown away because of a cease and desist order. I’m just happy I was able to get through this film without it getting shut down! JONATHAN – Well, if you knew you’d likely not be making a Deception III, then why include the cliffhanger at all? Why not just edit it out and save us all from a communal primal scream of frustration???? LEO – Hah! Yeah, that ending was always in the script as a little teaser. We’ll see what happens, though. Maybe I just like to troll the fans. 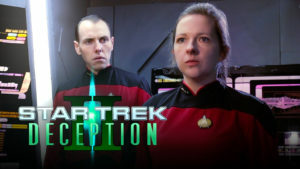 JONATHAN – Are you planning any other non-Trek fan films in the future? LEO – There’s always something bubbling away in the background that I’m playing around with, so who knows what the future might bring? JONATHAN – Indeed! Well, congratulations on finishing a second fan film masterpiece…and on finally getting your life back after five years! LEO – Thanks so much, Jonathan, for covering Deception and Deception II.